Hello to all the beautiful readers, who have open mind and whose thoughts run freely like wild horses. Let’s talk about what happen if you listen more! More I Know..Less I Think…. Absolutely True!!!! You have summed up everything in few words. I love this blog, you are an inspiration. Keep posting!!!!! Please!!!! You have talent of saying a lot in just few words …..very rare talent. Greetings from Paris!! I am trying to contact you if I can use this quote at my website of course with credits to you. I agree when they say you have skill of containing ocean in a cup. How wonderful it is that nobody need wait a single moment before starting to improve the world!!! 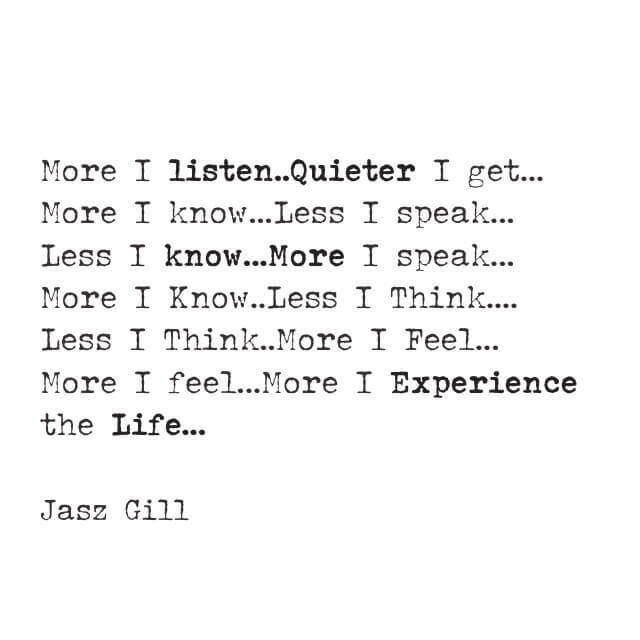 Well said Jasz Gill! I must say you have amazing blog!